This is a good example of why not to trust "polls". "A majority of the public supports a single-payer health insurance system, often called "Medicare for all,"
BUT BUT wait.... there is more!!! "The poll from the Kaiser Family Foundation finds that 56 percent of the public supports a single-payer plan. But when people are told that the proposal would “require most Americans to pay more in taxes,” support plummets to just 37 percent. And a majority of people (55 percent) erroneously believe they would be able to keep their current health insurance under a full-scale Medicare for all proposal." Same story with stopping global warming. The public only supports efforts if it costs them less than $10 each. The public wants Euro-style big government benefits and free stuff, without the Euro style taxation. How could a view become so twisted? Reading comprehension still eludes you? Better put down the Bong. 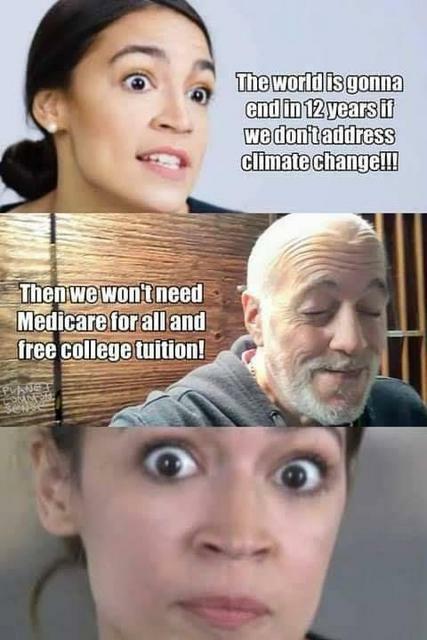 The point that went right over your heads is that: We don't have to raise taxes, we just have to prioritize our "spending"
ah yes, our genius rising star rookie rep from the Bronx... with many years of bartending experience. Here's your argument on healthcare "After we waste all our money on security and after all the money is looted by corrupt sweetheart defense contractors deals, there's no money left for us, so how do these left wingers propose we pay for it!!!!?? ?